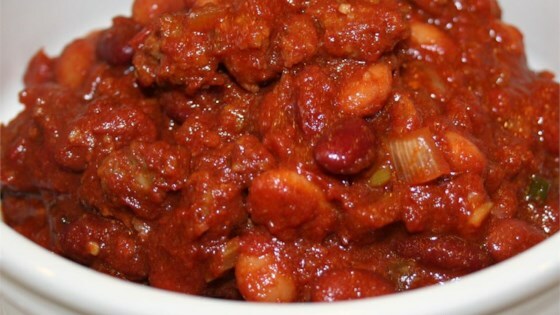 "This delicious chili took 2nd place at our local chili cook-off! Bet you can't eat just one bowl. If it is too thick, add water 1/4 cup at a time until you reach desired consistency. Even better tasting the second day!" In a large pot over medium-low heat, combine tomatoes, tomato paste, carrot, onion, celery, wine, pepper flakes, bell peppers and steak sauce. While tomato mixture is simmering, in a large skillet over medium heat, cook bacon until crisp. Remove to paper towels. Cook beef in bacon drippings until brown; drain. Stir chili seasoning into ground beef. Stir seasoned beef, cumin and bacon into tomato mixture. Continue to simmer until vegetables are tender and flavors are well blended. Stir in beans, cilantro and parsley. Heat through and serve.